After almost three months in Peru, we have finally arrived in a new country... Bolivia! Peru was physically and mentally challenging for us, and although we enjoyed our time there a great deal - we can´t say that we are sad to be moving on. During our last two weeks in Peru we more or less followed the most common tourist route (cusco-machu picchu-puno-lake titicaca). It was a beautiful ride, but being in more touristy areas certainly has its financial drawbacks! 81 km - biking and 80 km - walking ! After a rather painful decision making process in Cusco, we finally decided to visit Machu Picchu. For better or worse I seem to have a strong negative viceral reaction to doing things that `everyone does`.... and I think that there are very few people who visit Peru without a visit to Machu Picchu, and with 2500 visitors a day, it can get crowded. In addition to this, the entry price is hefty - over $50 US. Ok, this may not seem like a lot, but for us with our minute budget that just covers food and the occasional guest house... this was a big bite. But, Glenn convinced me that we should go, and I am glad that we did... even if the journey there may have been more enjoyable than the actual site visit! There are a few different options to get to Machu Picchu... ranging from a $200 train ride, to a bus-short walk combination, to the pricey inca trail.... to a very long, and very free walk along the train tracks. We opted for the 30 km free walk. We bought our machu picchu tickets at the office in Cusco, and the next day we biked 81 km to the town of Ollantaytambo. On the way to Ollantaytambo, my rear rack broke. We were luckily able to replace it with a cheap Peruvian variety. Then we were confronted with a super strong headwind... with big clouds of sand from the river side making it hard to see at times. The plan was to do our 30 km walk the next day, then visit Machu the following day. Unfortunately I was up in the middle of the night throwing up, and the next morning at 6am when we were supposed to be leaving for our hike... I had a fever. I was beginning to think that I was not supposed to visit Machu Picchu at all. To change our Machu tickets we would have to go all the way back to Cusco, and when Glenn called they informed him there would be a 30% fee to make the change (nothing about Machu Picchu is cheap). Since I was not able to do such a long hike, so we looked into the option of me taking the train... but that was $68. So, it turned out that the cheapest option would be for Glenn to return to Cusco by bus and make the change ($6 round trip). Our luck turned for the better, as for some reason Glenn was able to make the change free of charge... if he only changed it by one day. Fortunately I was feeling pretty good the next day, and we were able to do the hike. We left our bikes and most of our luggage at a hostal in Ollantaytambo, and first took a collectivo minivan about 10 km ($1.50) to the end of the road... also known as km 82 of the train tracks. Then we started walking. The trail stayed away from the train tracks for the first 11 km, and it was a beautiful walk... meandering through forests and inca ruins. Then it followed the tracks more closely, but fortunately most of the time there was a good trail. About a dozen trains passed us over the course of the day and the conductors always waved and smiled, even though one is not technically supposed to walk along the train tracks... By late afternoon, about 7 and a half hours after we started hiking, we made it to the town of Aguas Calientes, which sits 400 meters below the Machu Picchu site. We were actually quite soaked because it rained heavily for the last 5 km of the walk... so we found as cheap a place as we could hope for and tried to warm up. You can take a bus up to the site for $18 return, or you can walk. Guess what we did ;). We were told that the thing to do it arrive at the Machu Picchu site at 6:00 am. In retrospect, I would not recommend this... there were hoards of people waiting to get it at this hour - it felt like a line up for disney land - terrible. This might have been the worst part of the whole experience.... a slowly moving line of tourists moving up the incan stairs. But once we broke free of the crowd we got a beautiful view of the site, it really is quite a magical place. We then started our hike up Machu Picchu mountain...another 600 m up. The view from the top was incredible. Then we spent the next day and a half walking back down to Aguas Calientes and back up the train tracks. By the time we arrived back in Ollantaytambo our legs felt like some strange lead/jello combination. We were reminded once again that hiking and biking muscles are not the same. We ended up taking a day off in Ollantaytambo to rest a bit and do some washing. Finally we pushed off from Ollantaytambo heading in the correct direction...south. We were able to follow a lovely river for about 100 km until we reconnected with the main road south to Bolivia. We were looking forward to a tailwind leaving town as we had had a fierce headwind upon entry, and we were retracing our tire tracks.... sadly it was not to be, the wind was not behaving itself. We stopped at a welder along the river to have our Peruvian back racks improved a little. He did an excellent job reinforcing them and customizing them so that our panniers would fit better. They seem to be incredibly strong now, but also very heavy.... the trade off. Once we reached the main road, traffic was still surprisingly light and there was generally a nice shoulder to pedal on. We had rolling hills and the road very gently climbed its way up from 3000m to a pass of 4300m. After our intense ride from Nazca to Cusco, this felt quite relaxing. We even met some other touring cyclists along the way. Some of the highlights of this stretch included camping in some unmaintained inca ruins, visiting some deliciously warm hot springs at 4000 meters, and staying at a bunch of bomberos stations once again! Also, the dogs... who have been such a scourge throughout Peru, were totally relaxed...maybe it was the altitude? We also hit another milestone... with a new number to rhyme: 20202 KM! We arrived in Puno, and luckily had some info about a nice and cheap hostel from Margit and James... so we headed directly there. Puno is another touristy town, the main event seems to be visiting the `floating islands` on Lake Titicaca. The lake itself is the self-proclaimed highest navigable lake in the world (3800m). We didn`t end up visiting the islands... We were a little toursited out...But we did a bunch of errands and relaxing - more important events for us! The road to the Bolivian border followed the shores of Lake Titicaca for a great deal of the time, the views were lovely and the riding was easy. On the first day we stopped in the small city of Ilave, and were delighted to have happened upon a festival and parade around the main square. So as we ate our lunch were were entertained by beautiful dancing and colorful dresses. It turned out that a lot of the groups were from Bolivia, so we had our first taste of Bolivian culture. A festival and parade was also a nice opportunity to take some photos of people. Maybe it is my own hang up, but I generally feel pretty uncomfortable taking photos of people, of course I would always ask, but there is still something about it that feels a little icky. But, festivals are different, they are a time of celebration and lots of people are taking photos. We had intended to take the turn off towards Bolivia and the tourist town of Copacabana. This route towards La Paz, Bolivia is about 200 km, but we had heard that the scenery was very nice. 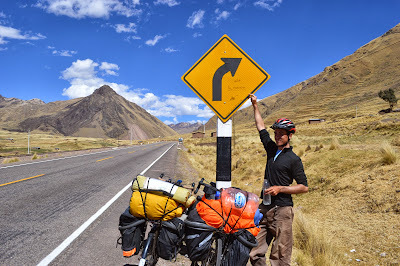 But, when we reached the junction there was a strong headwind coming from Copacabana and a tailwind along the other road that would take us to the other border town of Desaguadero. It was a fairly easy descision to take the tailwind road. This was also a beautiful route, and quite fast.... so we were quite pleased with our decision. Desaguarado is definitely a border town, all sorts of goods, money changers and garbage and grime... but it was farly small compared to other border towns we have been to and actually felt pretty relaxed. Unforunately we could not find any vegetarian food for dinner.... so we had egg salad sandwiches in our little hostal room.... somehow a fitting end to our journey through Peru.